Due to the enormous popularity of our Surprise Earrings, we just had to have a fabulous pendant to go with them! At a recent show one of our creative customers, Terri, suggested putting the filigree piece over a large shiny disc and then center it in our gorgeous large filigree flower. Oh yes! It has the same drama as the earrings and looks awesome on it's own too! We use a large twisted ring for the pendant to hang from your cord or chain. 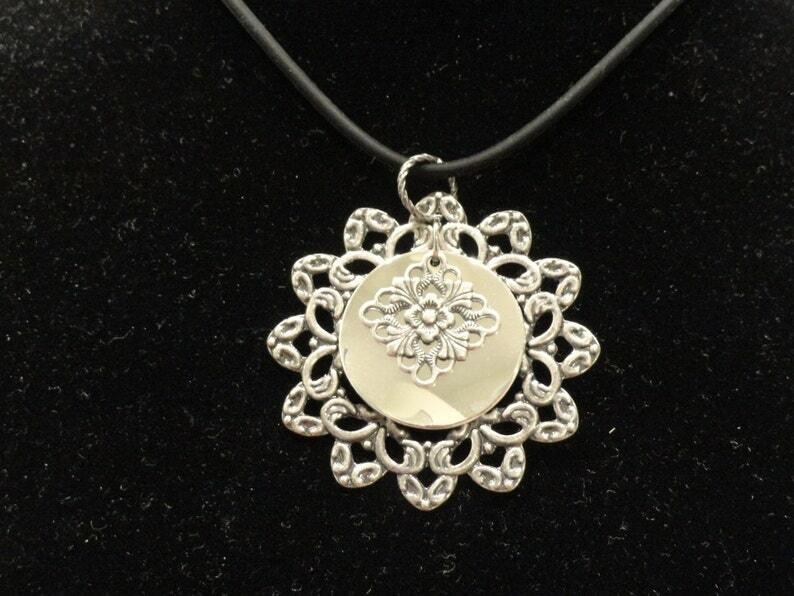 On this pendant, the filigree pieces are antique silver and the center disc is bright shiny silver. This pendant is lovely. I love it. Purchased the earring to match.